Almost everyday for past three years as I walked across the street towards university an old man sitting across the corner of a narrow ally greeted me with a gentle ‘bounjourno’. We did not know each other but yet we are friends of sorts. Unfortunately, in a few weeks time I will not see this friend anymore and I am sure he will feel my absence too. I am leaving Napoli. The lady downstairs who always speaks to me for few minutes very often will miss her ‘English man’. Unfortunately, she was always aware that I did not fully understand her ever, yet I managed talking to her. Can you believe that I already know a lot about her family history. I will miss the children playing and creating tantrums in loud voice in the compound of my building – that little Antonio is so wicked. The fat vegetable seller will not see me anymore – he loved me so much when I always used to go to him for buying vegetables and fruits until I discovered he is cheating me. I will miss the zingari lady and the little boy who sang like divine angels asking for money. I will miss my coffee shop friends who taught me Neapolitan and several times offered me coffee for free. But probably I will not miss my neighbors Mr and Mrs Salvatore Esposito who made every effort to break my balls. Naples is a carefree paradise and the Neopolitan life can have a long lasting and strong impact on you. Almost a decade back when I had been in Benaras in India, it had a sort of same impact on me. Coming to Benaras from Delhi was a cultural shock as in some way was coming from Montreal to Naples. The antiquity of Naples shattered all my miserable and romantic dreams of the glittering West and its modernity. 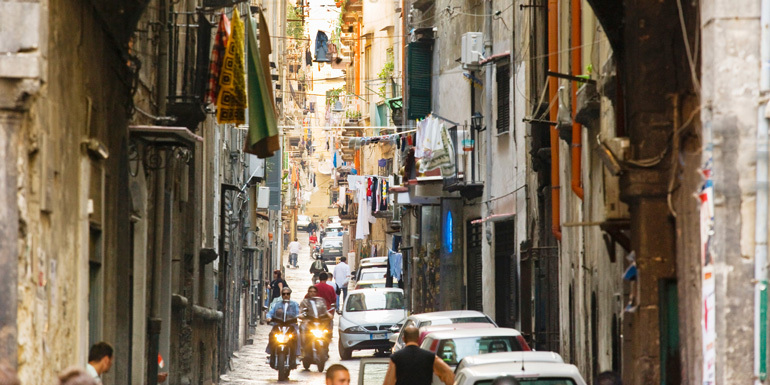 Life in Naples is like the ‘middle path’ of Buddhists – traditional and modern at the same time. Have you ever seen a little baby with its tiny hands touching its grandmother’s old and deeply wrinkled hand. This is exactly what I felt when I first walked on the ancient streets of this old Greek capital city. In those small ancient streets, life comes alive. It comes alive with the smell of coffee and Crocchè, dorate e fritte, arancine in via Tribunali. 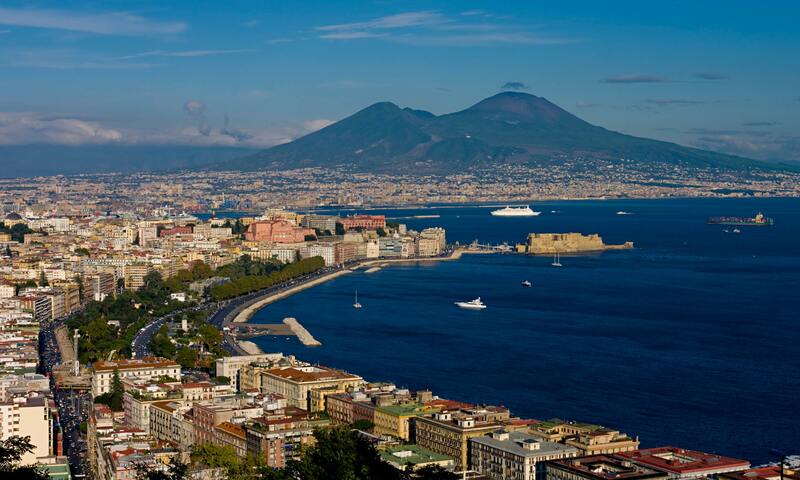 The air of Naples is intoxicating with an unparalleled sensuality that one can also feel in its antiquity. Each place I have lived in during past several years, I have experienced life differently but nowhere have I felt the life and its dynamism so closely as I did in Naples. Delhi, Pune, Oxford, Montreal did not teach me about life what Naples did, and to my astonishment I feel like that doll of salt (as Vedantins say) who when immersed in ocean is no more ontologically capable of describing its sweet experiences. Even though these feelings are inexplicable, but they are certainly sweeter than Sfogliatella and Baba combined. As John Keats said, “Heard melodies are sweet, but those unheard. Are sweeter.” But what are these unheard melodies? I often wonder what possibly it was that changed something so deep inside Nietzsche upon visiting Naples and its surroundings. So much so that it eventually proved to be the biggest turning point in his life. As he said, “In Sorrento, I shook off nine years of moss”. Somehow I truly identify with what this immortal thinker had to say except that my moss is not as old as his and by no means can I compare myself to Nietzsche. But I am sure our experience as non-Italians has been somewhat similar as far as Naples is concerned (apart from the fact that both of us always want to prove that ‘God is dead’ – Shhhhh….!!! I hope Papa Francesco is not listening). At the age of thirty-two when Nietzsche was already thinking of giving up his well-established career as a staunch Latin philologist, and turning completely to philosophy, I am just beginning my full time academic career confused and struggling to establish if I am a philosopher or a philologist or neither or either. And Naples somehow offers a balming effect to coup up with this subtle struggle within you. The wonder of sensual South is indeed inexplicable. Have you ever observed the changing colours of Mount Vesuvius clearly visible from your room. Even if it is taking a geological nap, it tells you a hundred thousand tales when you look at it either closely or from little farther. Even though I believe that the whole world is eventually the same, yet Naples is like a wonderland. It is silent, yet it speaks volumes to you. Neapolitan life creates an everlasting joy within you and the best or the worst thing is that the overflowing joy paralyses you to the level that you cannot express it or should I say you do not care to express it. 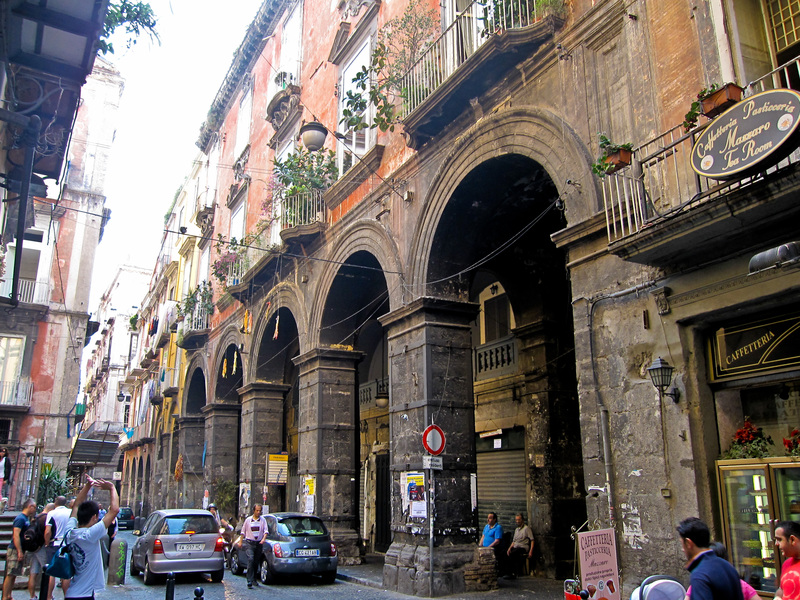 You become a puritan in Naples – the coffee and Pizza anywhere else except the city-centre in Naples is just useless. But I am still famous everywhere for drinking acqua sporca. Friyeriyelli still remains my best food here. Anto taught me the culinary skills of pasta – Pasta e fagioli – the poor man’s food. Like the motif of Paulo Coelho in the Alchemist “when you really want something to happen, the whole universe conspires so that your wish comes true”, the Neapolitan people conspire to make your stay comfortable. Even the people you do not know and probably would never know ever in future, play a role in comforting you. How can I forget that I am officially living somewhere else and practically living in Sanita. When I needed certificato di duso gratuto – even my students were ready to ask their parents to host me. It was like everyone in L’Orientale was conspiring how to manage my problem and everyone telling me – non ti preocuppa. Have you ever heard students taking their teacher to their own doctor because the teacher does not have a doctor – Luca did – not once but several times. And this was a luxury service available along with an English translator – Rosina. 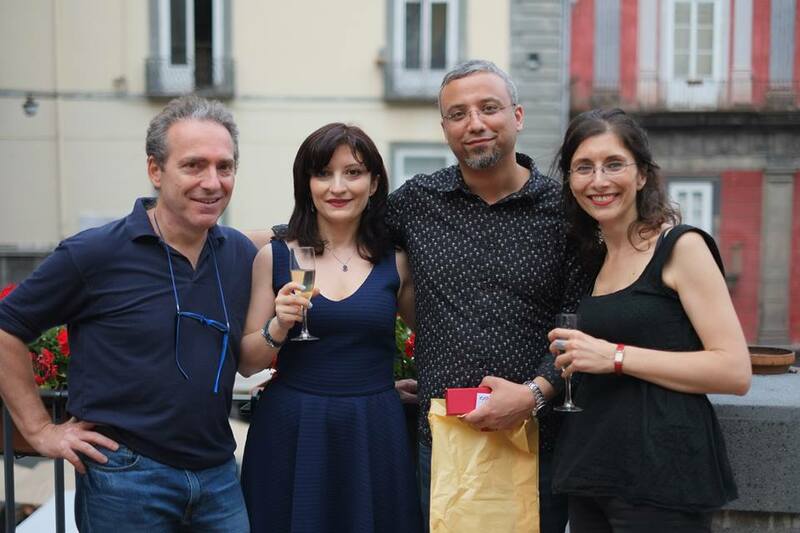 Some of my colleagues even conspired to hook me up with either their students or my own – in a hope that I could marry an Italian and be theirs for ever. Magari. I remain theirs for ever and I feel sad that my stark shyness disappointed them. If one thing that a human being should learn from life, it is to learn how to unlearn and I think Naples teaches you how to unlearn. Perhaps that’s how Nietzsche was able to shed off his moss here. As far as I am concerned, I have a love-hate relationship with Naples. The oxymoronic expression I use for Naples is ‘sweet poison’. The Mount Vesuvius is astonishingly beautiful but it is also wickedly dangerous. I don’t know how many of you have ever felt the experience of loving the dangerous beauty. I feel like Naples is my dangerously beautiful lady. It is often true that we do not realize the value of what we have. Many Neapolitans are not able to see Naples the same way as Nietzsche and I do. This is not surprising. They don’t know what they have and hence there is nothing to lose. Even many of my students do not like Naples at all. They want to go away from Naples, and I think that is perfectly fine. My love with Naples may be romantic, but I have loved every bit of my experience here. And this is how we learn to appreciate different cultures. My experience of reading Gayatri Spivak’s ‘Subaltern’ came alive in Naples when I often encountered how the parents of children from Vomero bar them from interacting with the so called rough boys of Naples. Often I used to observe while traveling in Circumvisuviana how the little vomero children traveling with their parents got curious to listen to the local Neapolitan songs sung in chorus by a group of local village boys in the train, but how they (vomero children) were discouraged by their parents not even to look at them. Indeed this is true of all dynamic cultures in the world. It is true of Naples and most of the parts of South Asia as well. Naples helped me in observing what I had earlier ignored in India. Life in Naples helped me in becoming more mature and developing more patience. Naples helped me in understanding how to deal with the patters of a certain culture and how to unravel its complicated textures. If Naples taught me patience, Fra boosted me with enormous levels of confidence. This extraordinary man of exceptional merits is a master par excellence. Thanks, Fra, for making it possible for me to live in Naples. Not only academically, but you have taught me how and why is it more important to be a ‘human’ first. This is why we study Humanities. I can never imagine working with any other scholar of your caliber like I did with you. How could you ignore all those silly mistakes of mine? If I think I am able to call myself a bit of scholar, I owe it all to you. Living and learning with you has made me a better person indeed. Your repeated suggestions and worthy pieces of advice, those after university walks to the train station, repeated jokes while working on Abhinavagupta will be cherished for all time to come. Your frankness and friendship, your trust and teaching – the assets I have earned from you will die with me alone. I salute you in fervent gratitude. If I was able to survive in Naples, the credit must go to Stefi. This lily-lady is like butter – soft and solid at the same time. I can never return my debts to her in this life, but I will try. She is innocently sweet, and a strongly touching personality. Thanks for spending hours with me in the immigration office, lending money to me without charging interest on it, for guiding me through my teaching profession, and above all for being my awesome boss. I live in Naples, but I am from Bacoli. Probably the first (and probably also the last) Kashmiri who has ever found a place in the records of officio anagrafia di Bacoli. Thanks to Genna and his parents. I owe a great deal to this sweet family and the love and care they have offered to me. Genna, I can never forget your mother calling me ‘magro’ all the time and stuffing me with enormous amounts of exceptionally delicious food. Thanks Franche, for showing me Palermo. I wish I could find a job there and live there for the rest of my life. Your family is too sweet and so are you. Thanks for being a wonderful friend. And thanks for being the first one along with Flori to pick me up at the airport and finding me the most fantastic home in centro historico. Thanks Flori, for everything. Your one advice was life-changing: “don’t let the lifeless manuscripts ruin the quality of your life”. Thanks for getting me here. I still have your passport copies in my computer and I am sure you will also keep the copies of my passport in your computer. ☺ Thanks indeed for organizing this wonderful event for me. I enjoyed every bit of it – sharing my love and leisure with my loved ones. Thanks, Gianni for being what I have found in you – an immortal friend. gānd marāo, chole khao. Thanks Tatiana and her family who made my initial stay memorable for all time to come. I can never forget those numberless lunches and dinners at your in-law’s place. Thanks for all the care and help you offered to me in those initial days. It would have been impossible to manage things without you. Thanks Dani (Daniela), for taking me to hospital once. I can never forget that dramatic night. Thanks Chiara for loving me so much. Your love has made me warmer. Thanks Pietro for those innumerable Qawwali sessions. I hope you will continue to send me more. Khan Sahab, I wish you could be living in Naples and we could have had more time to talk and share our South Asian agony. Thanks Lukes, for everything, for taking me to your doctor several times and for all little pieces of advice. Thanks for always accompanying me to the Post Office along with Annalisa and Rosina. Thanks Anto, for those numberless night strolls in Piazza Bellini with Peroni. We still have to look for Estonian girls around and I am sure we will not be hungry for too long anymore. And I do remember how many cigarettes have I stolen from you. It was a sheer joy to share a place with you, Vero and Eugen. Thanks to all my sweet students. If at all I have been able to pick up a little Italian, all the credit goes to you alone. All of you have been an inspiration to me that I will never forget in my life. Remember a teacher cannot be a teacher without a student. I have learnt from all of you as much as probably you have learnt from me. My students have made a big difference in my life. They have been as much my teachers as I have been theirs. I have been particularly happy to observe the positive intellectual growth of M.A. and III year students. First year and second year students have also been exceptionally promising. I wish all of you good luck and offer you my best wishes for whatever you choose to do in life. Previous Previous post: Arrivederci Napoli !